This is my lovely-looking petite great-grandmother Catherine Fraser, known as Kate to her husband. Not sure yet, but I may be facing several Fraser lines of descendancy but I do think it’s a fine name. Turns out both Catherine’s parents were Frasers who settled in Argentueil County, Quebec, around St. Andrews East. Many of her descendants through the generations have given the first (or second) name Fraser to their sons. Catherine was born 29 December 1833, daughter of John Fraser and his wife Nancy Fraser at St. Andrews East. (1) She married Peter Dougall there in March 1852. (2) The fact that Nancy was also a Fraser was reinforced by the marriage bond of Catherine’s parents in 1832, so I had two different "lines" to deal with. 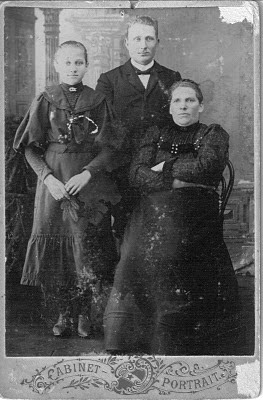 (3) A local history gave some lore about many Fraser families, but even along with church registers and census returns, not enough to figure them all out. (4) The parents John and Nancy Fraser do not appear in the local burial register or St. Andrews East Protestant Cemetery, so I didn’t know when they died. Catherine’s mother Nancy (short for the formal Ann) Fraser had a father called John Fraser, who was my Catherine’s maternal grandfather. (5) By eliminating another early John Fraser in the St. Andrews area, who came from Banffshire in Scotland, Nancy’s father John was most likely from Inverness-shire. His second marriage is documented in Montreal,(6) and his first marriage in Inverness has narrowed to two 'candidates.' The wife of one of them is yet another Fraser! The Inverness region was liberally populated with Frasers in the eighteenth century, and his ancestry is unresolved for the time being. Bingo! Three relationships mentioned in one source! Nancy’s identification as the widow of John Fraser and the mother of Mrs. P. Dougall (Catherine) was happy news. Even more intriguing was the reference to a Dr. William Fraser of Montreal. By tracing this medical man, the sibling of Catherine’s father, I was able to establish their roots in Killin, Perthshire, Scotland, for another two generations. Dr. Fraser will have his moment here another day. But I still wonder what happened to his brother John, my great-great-grandfather. (1) Photocopy from St. Andrews East Presbyterian Church register, Vol. II, p. 6. The registers 1827-1850 are also on Library and Archives Canada (LAC) microfilm C-2905. (2) Dougall-Fraser marriage, 2 March 1852, St Andrews East Presbyterian register; extract by minister W. Harold Reid, 23 September 1970. (3) Fraser-Fraser marriage bond, 5 January 1832, Library and Archives Canada, Upper Canada Marriage Bonds, RG 5 B9, no. 3322,; LAC microfilm C-6782. (4) Thomas, C. History of the Counties of Argenteuil, Quebec, and Prescott, Ontario. (Belleville, Ont. : Mika Publishing, 1981 reprint of 1896 original by John Lovell & Son, Montreal). (5) Ann Fraser baptism 14 June 1812, St. Andrews East Anglican Church register, 1812-1849; LAC microfilm C-2905. (6) Fraser-McIntyre marriage, St. Gabriel Street Presbyterian Church, Montreal, p. 24; Archives of Ontario microfilm MS 351 reel 1. (7) Renfrew Mercury, 8 February 1895. It's time I thought more about visuals. This blog is not keeping up with the herd. So here are a couple of photos related to the genealogist's favourite relaxing pastime: cemetery browsing. This is inside the grounds of the Bahia Palace in Marrakesh, one of the four royal cities of Morocco. The royals allowed their loyal servants to be buried in the grounds, although this particular dynasty themselves are buried in a mosque. Infidels are not allowed into mosques, except for the spectacular Hassan II Mosque in Casablanca. When I was there, we couldn't enter because it was the first day after Ramadan and the mosque was crowded with the faithful at prayer. Hassan II is the second largest mosque in the world after the one in Mecca. Its setting is spectacular on the gorgeous Atlantic coastline. This "gem" of a gravesite is only one of many, many artistic and creative personal burial markers in Novodevichy Cemetery in Moscow. Some are sculptures of the dearly departed; some are symbolic representations of their status or claim to fame in life. There are many notables from different walks of life. In fact, Soviet leaders who were buried in the Kremlin will be reinterred here. Kruschev already lies in Novodevichy, since he died out of office. Raisa Gorbachev's grave was smothered with flowers. The place is incredibly beautiful ... with narrow paths, tidy but not manicured, and one eyecatching monument after another. The cemetery adjoins a 17th century convent where aristocrats sent their troublesome wives. The convent in turn overlooks Swan Lake, said to be Tschaikovsky's inspiration. More to come on this subject, to be sure! The gem, of course, is Baltic amber. Since I retired from many years of client research work, and from the genealogy lecture circuit, I anticipated long, lovely days of freedom from deadlines. Freedom to compile my own family histories, and to pursue some of those unsolved client problems that still itch—problems that might contribute to the literature on case studies. Never mind some aspiration to fiction writing! Now I am wondering where my time management went, if I ever had it. To be up front about my dependency, I am wed to my computer—this box that sits under my desk, the monitor that shows me everything, and the keyboard in front of me. "Wed" may be the wrong word. It’s more like a life-support medical apparatus without which I am lost. It’s also called freaking-out desperation by this techno-dummy if the computer crashes or the email program goes wonky. Staying in touch with the (overwhelming) news of the genealogy world is absolutely necessary, given my stated aspirations. One must keep up with the activities of local groups and subscribe to email lists, as well as tend to the ever-growing list of favourite bookmarks. One must continue to learn the latest offerings and changes of important research centres. One must know the guidelines for articles submitted to different journals and magazines. So far, so good. In times past, I could have two cups of coffee first thing in the morning and fairly quickly dispense with the daily computer check-in ... with hours to spare for my real work. What is happening now? Almost everyone I know, and sometimes their dog or cat, has a blog. I’m not guilt-free myself. And of course I need to know what my colleagues and friends have opinions about. So how did it get to be the afternoon and I am still mesmerized, actually petrified (original meaning intended) in a sitting position that cries for immediate exercise. Where is my lunch? Why is the fridge empty? The electronic revolution seems to have a downside. My brain is so stuffed with interesting information I’m in danger of not enough mental filing cabinets. Should I throw out useless and amusing bits of trivia to make space for today’s allotment? Is that what they mean by garbage in, garbage out? Housecleaning is part of good time management, n’est-ce pas? In theory this would work if one had perfect control of the inflow and outflow—probably a matter of practice and discipline. In my case, the outflow can include the inadvertent oblivion of such essentials as how to make the DVD player work, pin numbers, user names, passwords, my children’s birthdays, and how my mother made hard-boiled eggs. Why would the pot want to boil itself dry? I remember an archivist speaking once in admiration of a remarkable genealogist who used to work in their collections: "She has probably forgotten more than we [archivists] will ever know." Simpler times, not so long ago, pre-Internet. He had no idea then how prescient he was. The information age may be wonderful, but aging itself resembles the goal of simplifying (some call it downsizing) physical space and possessions. I’m working on the management part. Useful or amusing suggestions are entirely welcome.